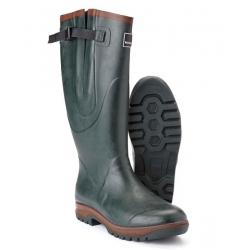 The Comfortable Toggi Wanderer Plus Wellington Boots in Green. The Toggi Wanderer Plus Wellington Boots have a thermal neoprene lining, rubber upper and dual density cushioned sole. With an adjustable side gusset for extra fit. The handmade Toggi Wanderer Plus Wellingtons have an expandable side gusset for extra fit options. They are fully waterproof, have a dual density cushioned sole and a thermal neoprene lining to provide superb comfort and fit during all country activities. These Toggi Wanderer Plus Wellington Boots - Made from the Finest Quality Materials but Affordable!